Does that title make you as happy as it makes me? Probably not, but let’s see if I can change that. 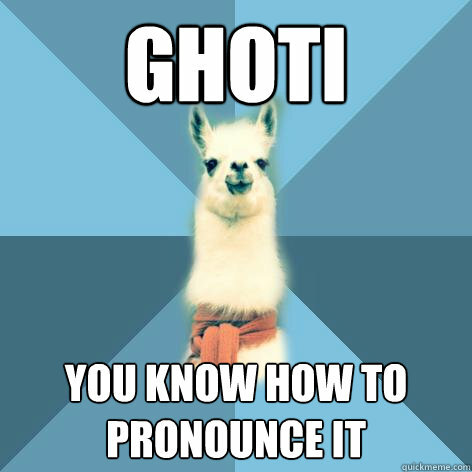 Obviously, the ‘sh’ in nation needs a larger environment to have its unusual pronunciation, as in ghotion. Likewise, ‘gh’ in tough needs to be syllable-final, as in roughotion [rʌfɪʃən]. That works, I guess, except for that tricky vowel. That silly vowel that makes people say WOAH-man. One such source of change are minims. “What are minims? !” you ask, impatiently. 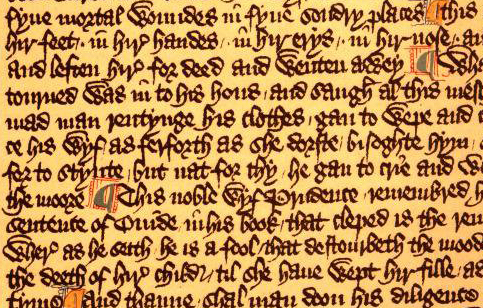 Well, back in the day of illuminated texts, scribes used to write in very elaborate script, and they used sequences of vertical downstrokes to signify 6 letters: i, m, n, u, v, and w. These letters were indistinguishable from each other. This means that a word like man would sort of look like this: ɪɪɪaɪɪ, and would look the same as wav, inan, maii, viau. For man this is not a problem, because it’s a common word with no potential homographs, but for several words it was. In those cases, the vowel, i or u, was changed to an o for legibility’s sake. Some were never changed back. Originally come was cume, love was luve, and woman, was wimman. They originals would have looked like this cɪɪɪɪɪe, lɪɪɪɪe, and ɪɪɪɪɪɪɪɪɪɪaɪɪ. 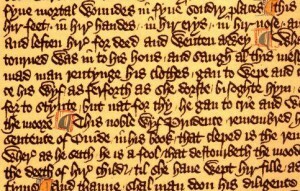 Even though an o was used in manuscripts, it was understood that the pronunciation was still the same. At some point, from second-language learners or a lag in education, this knowledge was forgotten or lost or ignored. So! The o’s in woman and women are placeholders for i. The first vowel in woman [wʊmən] became rounded from the [w]. The plural of wimman was wimmen, which was influenced by its second vowel and retained the original sound as [wɪmɪn] That’s why it’s written that way. Yeah! Mystery solved! Part 3: Gloria Steinem is often quoted as saying “A woman needs a man like a fish needs a bicycle.” Very often, I confuse Gloria Steinem with Gertrude Stein in my head. Influential ladies with similar names. Anyway, apparently Gloria didn’t originate the quote, Irina Dunn did. (100% failure of common knowledge about quotes today, team). Anyway, it’s a great quote, I love it, and it conveniently combines this fact that I just learned about minims and the persnickety old standby, ghoti. Miss Bri-annnnnnnnnnnnnnn-n, happy MirthDay 2 U! I never keep track, glad someone is.